How purr-fect is your Gallery? The DC Gallery line of PVC dioramas has an unauthorized visitor, as Catwoman breaks into the breakout series of collectibles! 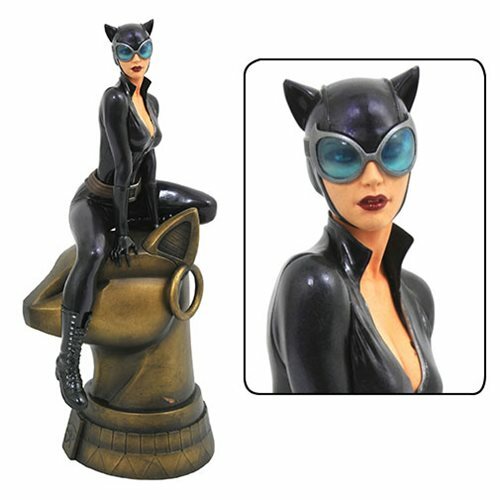 Perched atop a massive Egyptian cat-headed statue, Selina Kyle steals the spotlight in this 9-inch scale diorama, wearing her modern, curve-hugging black costume. Made of a high-quality plastic, and featuring a detailed sculpt and exacting paint applications, it comes packaged in a full-color window box. Designed by Shawn Knapp, sculpted by James Marsano!